I used the K&Co photo frames in the main Joyland kit, to display a range of photos that spanned the course of his first year - this was a great way to include lots of favorites on a single page! Since these were "faux" photo-strips, I needed to re-size all of these favorite photos to fit into the backside of the frame strips. I measured the opening of the frame and then set the crop parameters in my Photoshop program to slightly larger than the opening and cropped each photo to fit the frame. Since these were small image sizes, I was able to arrange a few of each onto a blank 4x6 document in Photoshop, and then economically print 4x6's from Costco (my local "everyday" printer of choice). I trimmed the photo from the 4x6 and adhered to the backside of each strip. 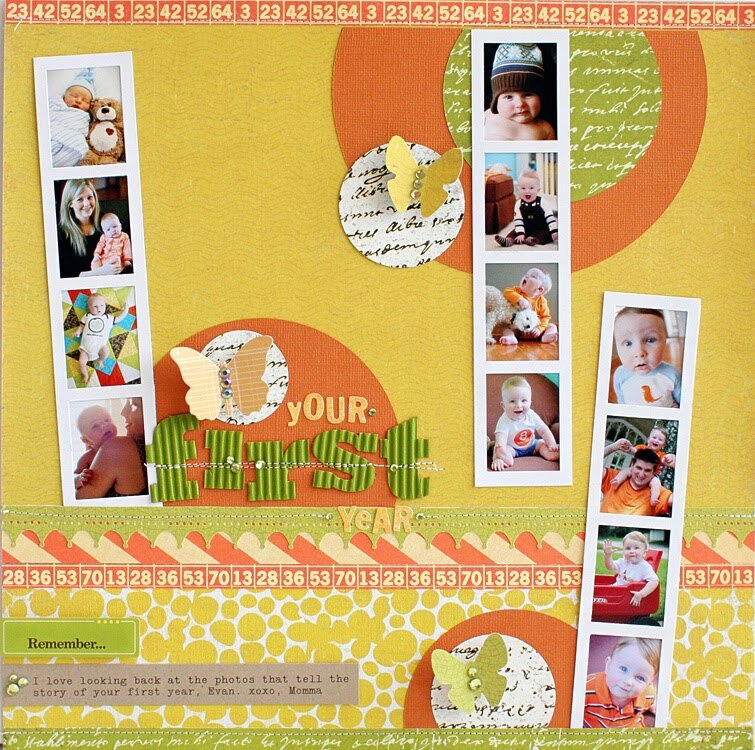 LOOOOOVE the look & effect of these "faux" photo-strips! Three large circles cut from coordinating patterned papers and arranged around the page, help to "anchor" each of my three photo-strips. 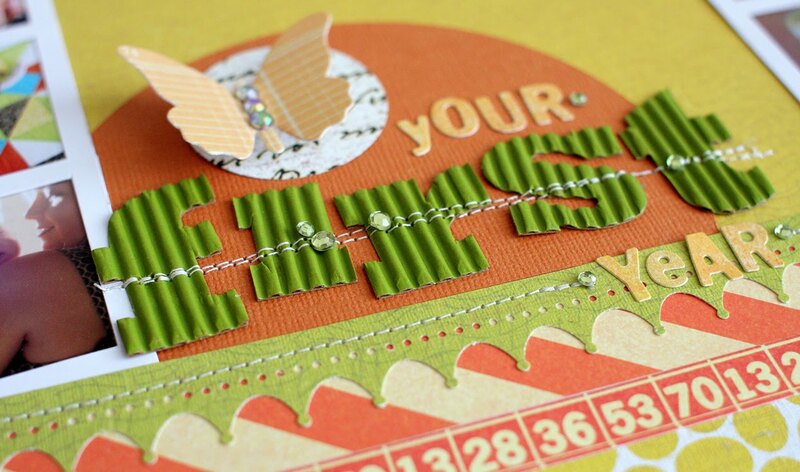 They are accented by smaller punched circles and butterflies... Two of my favorite punch shapes to add to my layouts! I used the Corner & Edge Crown Punch to create a horizontal border and dividing point along the bottom portion of my page. It also provided a place for me to stash part of my title. A quick journaling strip at the bottom of the page helps to explain what the page is about - but really the photos are the stars of the page that tell the story (when combined with the title!). LOVE this layout, Susan. Thanks for sharing your process! Absolutely love this layout! ... I still have to do a "wrap-up" page for my son's first year, and I think using those frames is the perfect idea! This is such an incredible LO - I was just admiring it on your blog this morning. It's on my "must-lift" list. Thanks for the run-down on it! I wanted to lift it and now you have made it much easier! Thanks so much Susan! 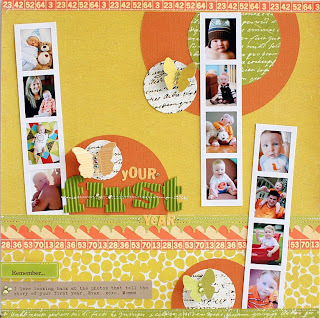 This layout is fabulous Susan! Thanks for the details on what went into it! I love this LO, thanks for the explanation. Thanks for the tips, I always love to hear about the creative process. I am finishing up a Christmas mini-album and those frames might be just the thing to get more pictures into the album.